Since its inception, the RAAF has frequently had units based overseas on operational deployments.... In the 1950s, Britain, Australia and New Zealand agreed to set up a Commonwealth Strategic Reserve on the Malayan peninsula with the primary aim of countering a growing communist threat across SE Asia. In May 1948, Australian Prime Minister Robert Menzies, announced that a Squadron of 8 Dakota Transport Aircraft and a Squadron of 6 Lincoln Bombers would be sent to Malaya to supplement the Far East Air Force. These two Squadrons were Nos 38, and 1 SQN, and were grouped together and commanded by Australian Officers. On this day, the first C-47 Dakotas belonging to No 38 Transport Squadron arrived at Changi airfield, on SingaporeIsland, to fulfill an Australian Government commitment to assist Britain during the ‘Emergency’ declared across Malaya. Commanded by Wing Commander J.F. (‘Ginty’) Lush, the unit’s eight aircraft were used to move cargo, troops and VIPs, sometimes as far as Ceylon, Hong Kong or Japan, carry out supply and paratroop drops and casualty evacuations, and participate in psychological operations involving leaflet drops. Australia’s commencement of a concurrent commitment in Korea, within a week of the Dakotas’ arrival, led to the transfer of half the squadron’s aircraft to that theatre of operations in November 1950. 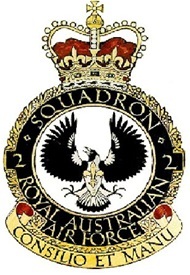 Two years later, with the RAAF’s commitments having continued to escalate beyond the capacity of its transport fleet, 38 Squadron was withdrawn to rejoin No 86 Transport Wing at Richmond, New South Wales. The Lincolns were based at Tengah on the Western side of Singapore, and the Dakota Sqn was based at Changi, on the Eastern side if the island. No 38 Sqn's first mission in support of Operation Firedog, as the air campaign in Malaya was known, was flown on 21 July 1950. The captain of the flight, Sqn Ldr J.B.Fitzgerald, completed a routine courier run to Kuala Lumpur, Ipoh & Taiping. 38 Sqn was withdrawn because of increased airlift demands in Australia and overseas in 1952. In April 1955, Australian Prime Minister Menzies announced the decision to commit Australian Forces to the Commonwealth Strategic Reserve. Two Squadrons of Sabre aircraft and No 2 SQN RAAF flying Canberra bombers were to be allotted. These units were based at the RAF airfield at Butterworth, opposite the Pearl of the Orient, Penang. As usual, a RAAF Airfield Construction (No 2 SQN ACS) paved the way for these squadrons. Six hundred Malay, Chinese and Indian labourers were employed to help the 300 Australian Construction SQN staff lay the strip. When the work was completed in 1858, the airstrip could handle any Commonwealth aircraft, including the RAF nuclear-armed V Bombers. Australian Canberras arrrived in July 1958, followed soon thereafter by the Sabres. C Flight of 2 SQN were equiped with Dakota aircraft, which in addition to the airlift tasks, provided VIP services throughout SE Asia. 18/02/1959 ….Operation Sabre Ferry ended with the arrival of the last Sabre jets of No 78 Wing at Butterworth Air Base, Malaya. In 1958, Australia had pledged to send the two units of No 78 (Fighter) Wing Nos 3 and 77 Squadrons to join a new British Commonwealth Strategic Reserve in the region. Getting the relatively short-ranged Sabres to their new base was a major undertaking. No 3 Squadron set off first along the 9700-kilometre route, with 19 aircraft leaving Williamtown, NSW, in groups of three to four on 27 and 29 October 1958. Their movement was supported by other RAAF aircraft (Canberras, Neptunes and Dakotas). From 5 February 1959, the first of 16 aircraft from No 77 Squadron left from Richmond, this time with two of the RAAF’s new C-130 Hercules transports taking the place of the Dakotas. By 18 February, 78 Wing was complete at its new location. On 01JUL1958, eight Canberra bombers from No 2 Sqn arrived at Butterworth, Malaya. With the concurrence of Malaya and the UK, the RAAF assumed control of the base, and became the most forward Commonwealth air base in SE Asia. It provided permanent facilities for the RAAF for three front line squadrons and ancillary units. The Canberras, equipped with the more powerful 109 engines, flew Firedog bombing missions both with a ground radar unit and visual sighting, against the communist terrorist groups in (then) Malaya. Most of the missions were conductedat medium altitude 15-20,000 feet in thick jungle, so bombing effectiveness was difficult to determine. Eventually, the terrorist groups retreated to the Thai/Malaya border areas and engaged in harrassment and occasional raids in border areas,but posed no threat to bases , main towns, or the people. Following cessation of the emergency in July 1960, crews practiced mostly low level bombing, as conventional wisdom demanded very low level attacks to avoid SAMs and achieve surprise. Life in Butterworth and Penang was exotic after Australia, especially those fortunate to live on Penang Island. The mix of colonial and Asian architecture, the tropical climate, the Asian food and the Duty Free shopping, made the posting to Butterworth a great experience. The Squadron maintained an operational state of readiness and operated with allied air forces in Singapore,India,and Philippines. Various deployments were conducted for SEATO and other air defence exercises: Exercises "Air Boon Choo" to Ubon, Thailand, "Shiksha" with the Indian Air Force at Agra, and "Joss Sticks" to Clark AFB in the Philippines and Kadena AFB, Oinawa are examples. In January 1963, Dr Subandrio...the Indonesian Foriegn Minister, described the situation between Malaysia and Indonesia as "Confrontation". Over the next few years Indonesian activity against the new federation included parachute drops near Johore, small unit raids and armed schirmishes, especially in Borneo. The RAAF were particularly interested in any illegal intrusions of Malaysian air space. No 2 Sqn prepared briefs containing photograhs of targets in Java, routes, and likely enemy defences. While this was going on, two Sabres from 78 Sqn were permantly stationed at the end of the Butterworth runway, equiped with Sidewinders and canons on Alert 5 status, 24/7. This continued until late 1965, when Sabres flew to Labuan to bolster RAF air defences in Borneo. After a coup in Indonesia in SEP 65, the Confrontation fizzled out, and was declared over in August 1966. The arrangements for RAAF Sqns based at Butterworth as part of the Commonwealth Strategic Reserve from 1958 were politcally complex. As well as fighting insurgents in Malaya,Commonwealth Forces were also deployed to oppose communist agression against the South East Asia Treaty Organisation (SEATO) protocol states of South Vietnam, Laos, and Cambodia, a contigency which seemed more likely as time progressed. Conditions in Indo-China were perceived to be worsening during 1960-61 as communist activity increased, in mid 1962 Australia announced that a Sqn of RAAF Sabres would be stationed at Ubon in Thailand, to help maintain their territorial integrity. In May 1962, eight Sabres from 78 Wing Butterworth, were flown to Ubon via Singapore, such were the political problems of the day, and those aircraft became No 79 Sqn. This ocurred because Australia did not want to appear to be sacrificing its SEATO committment to Malaysia. The Airbase at Ubon was only 50 ks from the Laotion border, 80ks from the Cambodian border, and 200ks from the HoChi Minh trail, the main supply lifeline for the communists during the Vietnam War. In addition to 79 Sqn, a small HQ, and a Base Sqn completed the Australian Camp, which consisted of about 20 officers and 200 airmen. Tours for 79 Sqn were initially set at 3 months, but were later increased to 6 months, HQ and Base Sqn staff were assigned for one year stints. In practce, the pilots stayed for shorter periods but completed multiple tours by changing over stealthily with their collegues from 78 Wing. Two Sabres from Butterworth would fly in close formation with a 2 Sqn Canberra towards the Thai border, where they would be intercepted by two Sabres from Ubon. Once the five aircraft joined up, they became indistinguishable to any ground or radar observer, the Ubon Sabres would return to Butterworth, and the Butterworth Sabres would recover to Ubon. Much of the work done in Ubon was training, but RAAF Airfield Defence Guards were given permission to patrol far beyond the perimeter fence of the base, and this provided a much better security for the base. An example of could or did happen, was that guerrillas attacked the American Radar Unit in May 1965, and at the same time, aircraft were fired upon while approaching the airfield. 79 Sqn subsequently withdrew from Ubon in August 1968, but the US certainly appreciated Australia's committment there. 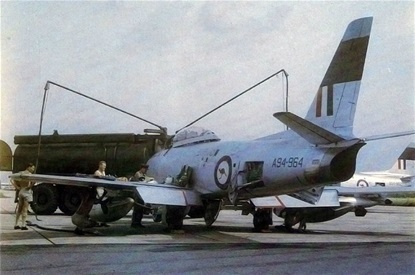 Sabre Aircraft 964 gets refuelled at RAAF Ubon. In May 1962, Australia joined several South-East Asia Treaty Organisation partners in rushing forces to north-east Thailand to protect against an anticipated communist invasion from Laos. On 28 May, ten F-86F Sabre Mk 32 jet fighters from RAAF units at Butterworth, Malaya, were sent to Singapore, where eight of the aircraft formed into No 79 Squadron. On this day, the new unit flew into a Royal Thai Air Force base at Ubon, 80 kilometres from the Laotian border. During the next 10 days, RAAF C-130 Hercules from Richmond, New South Wales, also flew in a base squadron of 200 men and 450 tonnes of supplies and equipment to establish a tented camp. Although the crisis which prompted the deployment was defused by negotiation, 79 Squadron remained at Ubon until August 1968, as part of an integrated air defence system protecting American forces engaged in bombing North Vietnam from communist retaliation. Especially the games of 500 played into slouch hats...buses, ferry & bus again. Brings back memories July 62 and periods through to Jan 66. Thanks for getting back to me Don. My Dad was an Engine Fitter with, I think, 77Sqn at Butterworth and including detachments to Labuan and Ubon. Hi Ern. I do remember Tich Hulbert. After all this time, those memories are a little vague though. With your prompt, my brain is madly sorting memories. Hi Don, did you know or work with my father WOff Tich Hulbert? Posted to 78 Wing Jun '65. Labuan with 77 Sqn det Oct 65 then Ubon with 79 Sqn for 6 months. Later in transferred to 2 Sqn and went to Phan Rang Apr 67. Thanks for getting back to me Alf. There are some good pics of 77 Sqn at http://www.no77.squadronassociation.org/gallery.php?gpID=7&galID=23. Ern, His name certainly rings a bell, but I can't recall exactly where we would have met each other. Hi Alf, did you know or work with my father WOff Tich Hulbert?